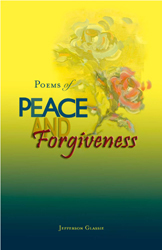 This book captures the concepts from Glassie’s book, Peace and Forgiveness. These beautiful poems explain there’s no right or wrong, no evil or sin, in the Universe. Everything that’s not love is just based on fear. Glassie teaches the lessons of forgiveness that can lead to peace of mind, and peace in our society. We are all one, in perfection.